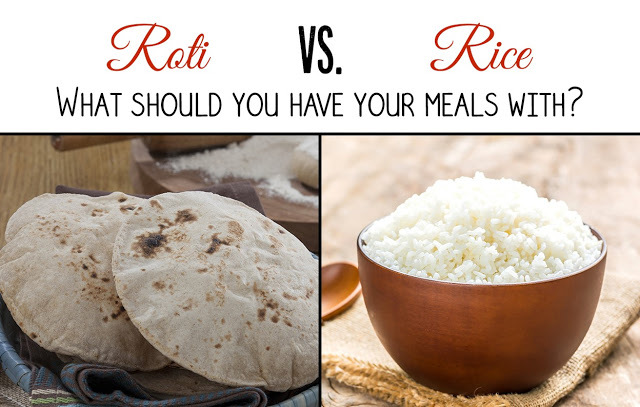 Roti vs. Rice- What should you have your meals with? The nutritional conflict between rice and roti is age-old, as primary staples of every Indian cuisine. White rice and wheat chapattis are both infused with considerable amounts of protein, calorie, fat as well as fiber. This overlap makes it tougher to choose just one as an accompaniment with your meals. The health-conscious can take a sigh of relief with this list of effective benefits of the two. Let’s pit them against each other! #1: If you opt for a lighter meal… Choose rice! Boiled white rice is easier to chew and digest as it is low in fibers. For those with issues of diarrhea, colitis, an upset stomach or morning sickness, rice is a favorable choice. If you are suffering from chronic gastrointestinal distress, rice is recommended for you. Tip- You can consume a bowl of steamed rice with sautéed vegetables for a wholesome meal! #2: If you are looking for muscle growth… Choose roti! Rotis are the best food accompaniment for vegan and vegetarian bodybuilders. At home, you can mix a variety of whole grains to harness the benefits of calcium and other minerals. Wheat chapattis made of whole grain consist of complex carbohydrates that boost your energy. Tip- For reducing your portions, have two servings of roti (without ghee) with a large bowl of home-cooked yellow dal. #3: If you have a heart condition… Choose rice! For you to keep your heart healthy, the consumption of rice is vital. Brown as well as white rice is full of fibers and high in magnesium, niacin, phosphorus that can prevent heart problems. Rice helps you in lowering bad cholesterol levels. #4: If you want to feel fuller… Choose roti! For weight watchers, who want the feeling of satiety for longer periods should include rotis in their meal. Wheat rotis take longer to digest which helps in maintaining blood sugar levels. This quality also makes it a good alternative for diabetic individuals. Wheat rotis are nutritious and contain vitamins B1, B2, B3, B6 and B9 that help in keeping you strong. Tip- While kneading the wheat dough for the rotis, you can add soya powder to increase its protein content. To escape the dilemma of choosing between these two healthy and tasty staple sides, try switching to whole-wheat rotis and brown rice. Savor both, guilt-free!